Track your Xbox 360 Games, Wishlists and Now Playing lists and keep up-to-date. Send a Friend Request | Last Seen Playing "Bound by Flame"
Bound by Flame is an action role-playing game that lets you play as a mercenary posessed by a flame demon in a dark fantasy universe. ... more info..
Burnout 5 gives players license to wreak havoc in Paradise City, the ultimate seamless racing battleground, with a massive infrastructure of traffic-heavy roads to abuse. Gone is the need to jump in and out of menus and aimlessly search for... more info.. The drivers in Split/Second compete in a reality television show, racing through locales in a made-for-TV city. Like Electronic Arts' Burnout franchise, Split/Second emphasizes vehicular mayhem and destruction. However, according to the sta... more info..
Rayman Origins is the story of two friends, or rather two outrageous scoundrels that spend their time pestering the little magical folk. Yes, in the beginning Rayman was more into handing out free slaps than into world saving... more info..
Army of Two throws gamers into hot spots ripped from current day headlines where they will utilize unique two-man strategies and tactics while seamlessly transitioning between playing with intelligent Partner AI (PAI) and a live player. Whe... more info..
Bungie's popular first-person shooter makes its debut on the Xbox 360 with Halo 3. The epic saga continues with Halo 3, the hugely anticipated sequel to the highly successful and critically acclaimed Halo franchise. In this... more info..
A new breed of WARRIOR returns, committed to destroying the enemies of FREEDOM! 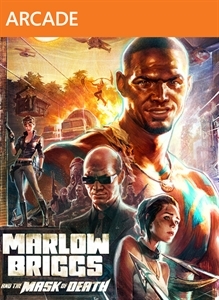 No-nonsense hero Marlow never shied away from danger or trouble. But now he faces his ULTIMATE challenge. Blasting into Central America, he has an industrial ev... more info..